If you came here looking for a leafy, raw vegetable salad, you will not find it in this recipe. Salade Niçoise is actually a salad of cooked vegetables with tuna, and if made correctly turns out amazing. It’s fresh, healthy, and full of flavor. Instead, this Salade Niçoise is a lovely blend of vegetables and perfectly cooked tuna. It’s perfect for an entire meal, and since it cooks so quickly (in about fifteen minutes) you could make it for lunch of dinner, even when you’re in a rush. 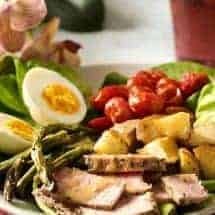 Traditional salad niçoise features steamed or boiled potatoes and green beans and, often, canned tuna. It also takes multiple steps, where many of the vegetables are cooked separately. This air-fryer version allows you to cook everything together, simply by adding the tuna after the vegetables have cooked for a little while. Canned tuna can just ruin this entire dish. I’m all for skipping steps to make a recipe more efficient when it doesn’t change the flavor, but canned tuna definitely changes the flavor. Don’t use canned tuna. 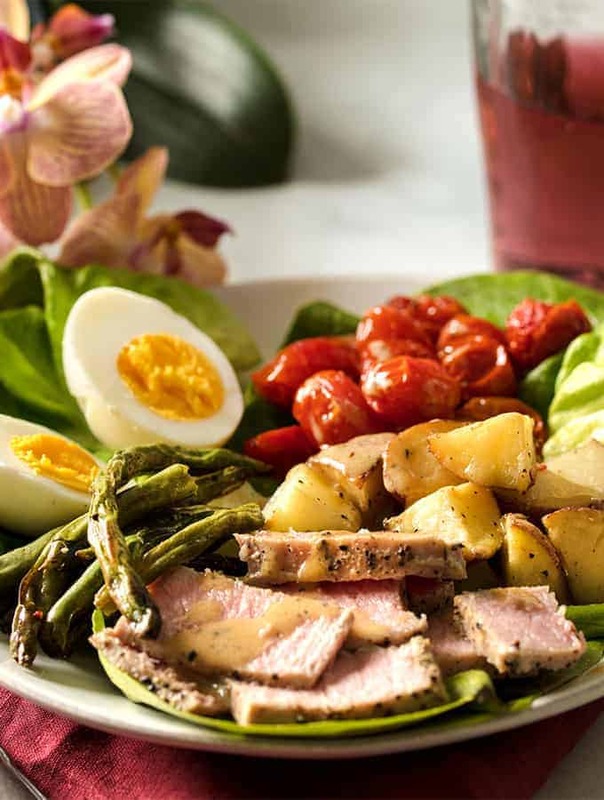 If you use a fresh, amazing tuna filet you will really enjoy this Salad Nicoise. Okay, let’s talk taste. 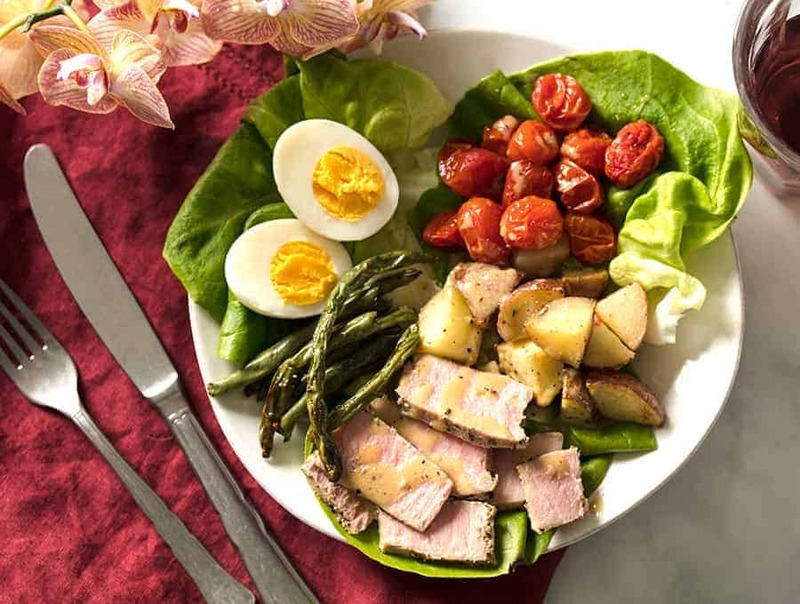 This Salade Niçoise tastes crisper than a traditional Salade because the traditional recipe calls for boiling all the ingredients. Here however, I wanted to air fry or bake them to get a quick meal. it’s actually a great example of how to use the same ingredients but how to cook them differently for a different taste. If you like you can steam all the ingredients and combine them, and enjoy your salad that way as well. 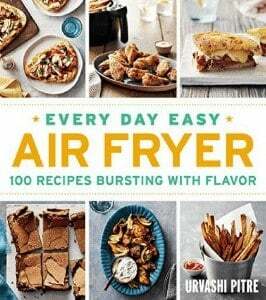 LOOKING FOR MORE DELICIOUS MEALS TO COOK IN YOUR AIR FRYER? TRY OUT MY AIR FRIED CHICKEN LEGS WITH CILANTRO PESTO! Don’t throw the tuna in at the same time as the veggies. The vegetables need to cook about three times as long as the tuna does. Don’t skip the step where I tell you to press the salt and pepper into the tuna, or all your seasoning will likely fall off and you will have bland tuna. For the salad: In a small bowl, toss potatoes, green beans, and grape tomatoes with the 2 teaspoons vegetable oil, salt and pepper. Arrange the vegetables in a single layer in air fryer basket. Set fryer to 400°F for 10 minutes, shaking halfway through cook time. After 10 minutes of cook time, brush tuna on both sides with a 1 tablespoon vegetable oil and season to taste with salt and coarsely ground pepper. Press the salt and pepper into the tuna so they will stay put. Add tuna to basket on top of the vegetables. Cook for 5 minutes for tuna that is cooked medium-well. At end of cook time, remove tuna and let it rest for 5 minutes. Slice tuna thinly across the grain. Meanwhile, for the vinaigrette: Combine vinegar, salt, mustard, olive oil, black pepper, and Herbes de Provence to taste in a small jar with a lid. Shake to combine. Place 3 lettuce leaves on each of two dinner plates. Arrange tuna, green beans, tomatoes, and potatoes in small piles on lettuce. Place 2 egg halves on each plate. Scatter olives over. Drizzle all with the vinaigrette. Serve immediately.